Attention all SXSW attendees! 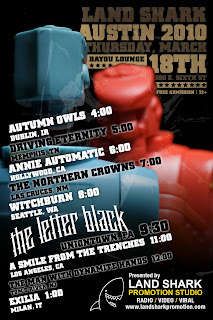 Be sure to attend Land Shark’s 2010 Showcase tomorrow, March 18th, at Bayou Lounge. Festivities begin at 4PM with Autumn Owls followed by Driving Eternity, Annie Automatic, The Northern Crowns, Witchburn, The Letter Black, A Smile From The Trenches, The Man With Dynamite Hands, and Exilia set to play at 1AM. It’s a FREE show (21+ & over) – and, as an “unofficial” event, please note that no SXSW badges or wristbands are required for entry.